The day will consist of short and sustained experimental drawings of two models in OVADA’s main warehouse space. Using various media the intention is to focus on the possibilities drawing offers the experienced and less experienced student. It is hoped that the class will refresh your approach to drawing the model. 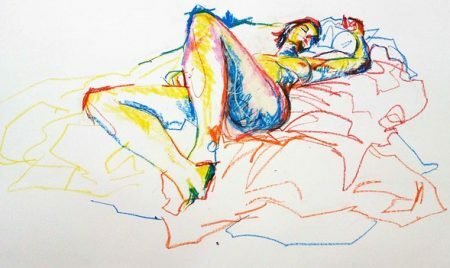 It will suit all those undertaking Life Drawing for the first time and those wishing to take a fresh uninhibited approach to their personal practice. Refreshments available all day, but please bring a packed lunch. OVADA will provides materials, boards, easels, but paper is costed at 25p per sheet used. You are welcome to bring your own drawing materials as well of course. Venue: OVADA, 14A Osney Lane, Oxford OX1 1NJ.